Because I have long dark hair and wrote a olive oil dessert cookbook, often people think that I am of Italian descent. I was once at a friend’s home for a wedding reception and their entire family was there. A bunch of people were crowding in the kitchen (where I almost always find myself at gatherings like this), when I was asked more than once, where I fit into the family (cousin, aunt, the wife of a mobster)? I answered that I was a Antonio’s cousin. I didn’t know anyone named Antonio; I just pulled that name out of thin air. So here I was waiting to say the words “just kidding”, but no one questioned me. I guess there must have been an Antonio and he must have been ridiculously good looking. What an honor to be mistaken for an Italian because other than California olive oil, I believe some of the finest olive oil comes from Italy. I also believe that Italian food is a gift from the Gods. 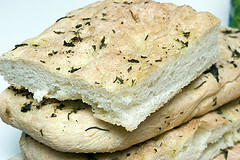 One of my favorite delights from Italy is the bread, especially facoccia bread. Nothing makes me daydream more than the thought of a warm piece of facoccia dipped in a blend of extra virgin olive oil, balsamic vinegar, and fresh basil. In fact, it is a family favorite. When I bake facoccia bread it is as if the aroma transcends out the front door and down the street, because the door starts knocking and doesn’t seem to stop until the bread is gone, gone, gone. If you enjoy a good, crispy, yet soft, flavorful bread, than this simple and delightful piece of Italy is calling your name. BUON APPETITO! In a large bowl, dissolve sugar into 1/4 cup of the water. Sprinkle in yeast and stir well. Allow to proof (will look bubbly) about 5 minutes. Add remaining 2 1/2 cups of water, olive oil, and salt. Add flour in one cup increments. Knead dough until smooth and elastic, 4 to 5 minutes in an electric mixer fitted with a dough-hook , or 8 to 10 minutes by hand. Form dough into a ball, and place in a slightly oiled bowl. Cover with plastic wrap, and let rise at room temperature until doubled in bulk, 1 to 1 1/2 hours. Spread dough evenly onto an oiled baking sheet. Spray tops and cover with plastic, and let rise for 30 minutes. Dimple surface of dough with your fingertips, leaving deep indentations. Cover again, and let rise until doubled, 1 1/2 to 2 hours. Pre-heat oven to 425°F. Drizzle some olive oil on top of dough, allowing dimples to fill. Gently spread oil over surface without deflating dough. Brush lightly with water, then sprinkle with salt; pepper, herbs, and Parmesan cheese. Bake for 25 to 30 minutes, or until golden brown. Remove from oven, and slide onto a wire rack. Serve as soon as possible.